A great non-permanent form of vehicle advertising, fully weather resistant, easily applied and removed, yet stays attached at high speeds. Non-damaging to paint and can be any shape or size. These suit the New Zealand Weather and are built to last . They are printed with photo quality fade resistant inks for either text or photos. We print any image on magnets (including color photos). Prices do not include GST or Freight in New Zealand. For Larger quantities, die cutting, special shapes, hole drilling. Please request a quote for your requirements, or if you need a magnet that has any special requirements. 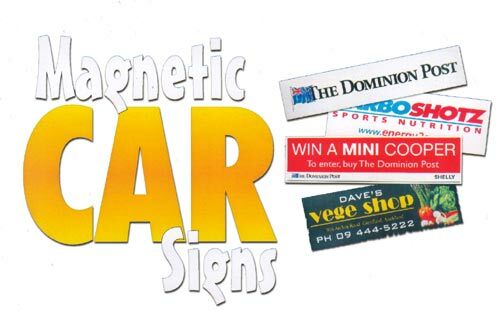 Click here for our refrigerator magnet range!